In this tutorial I want to show you how to connect App Inventor to a MySQL database using PHP. I tried to keep everything as simple as possible while at the same time teaching enough so that you can do anything. You’ll be able to submit to, update and then receive a CSV file from the database using the PHP files below. You’ll also be able to limit access to data simply by creating a different PHP file for each person that would need to access the database. Everything you need can be found below. I’m looking forward for the next contest…. my android app is almost ready.. is it soon? Thank you so much for an amazing video! Hey Derek, love your videos. 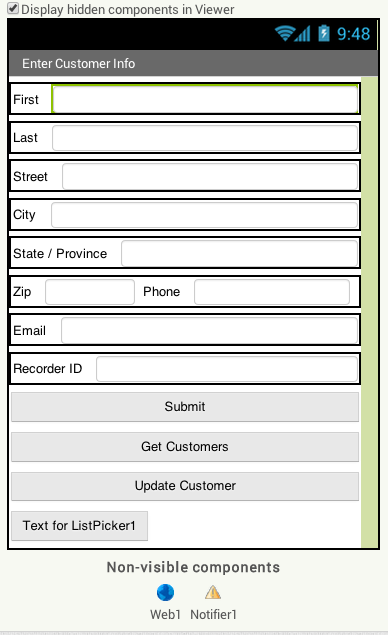 I am trying to make an app for a company that allows them to search an existing database based on entered input. For example: they enter Janitor as job and building as east tower, it will retrieve all janitors who work in the east tower. Thank you 🙂 I have everything pretty much here for that. If you need more help learning SQL I cover that as well. Tell me if you need anything else. Thanks for the video Derek, it’s a big help and much appreciated! I was wondering if you could at some point cover security and validation for the scripts as mentioned in the video? Or point us to some good examples we can use with your scripts above? You’re very welcome 🙂 I’m planning a PHP / Zend tutorial in which i’ll cover all that you requested. A learn PHP in 30 minutes and a PHP web services tutorial should be out this month. 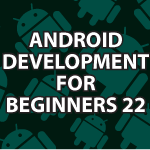 tutorials have propelled me forward in PHP, Java and now Android APP Inventor. Thank you so much. You’re very welcome 🙂 You’ll have to program everything in php. I’ll be making a new PHP tutorial very soon and here is my latest one that covers everything you need. I have been following your instructions for this tutorial, however I am having issues with retrieving the information from the mysql database to the app inventor. What errors are you getting? I have copies your code and the blocks exactly with the exception of the database connection. any suggestions would be wonderful. ive tried everything i could think of, but not sure why i cannot fix this?! Thank you 🙂 It is hard to figure out what could cause that error. Are you using the exact same blocks, database, etc. that I use? is it possible to receive a link for aia download? Thank you 🙂 I have everything for free on YouTube. My host doesn’t allow me to host the videos myself. Thanks alot it is great tutorial. I have question. How can I add image url to ListPicker? You can change images in a list picker that has been uploaded, but I don’t believe you can use a url. I’ll have to test, but I’m guessing this is a limitation. Thank you so much for all the time and effort you put into these tutorials, you are a star!! I’m glad I could help. Most of the work of logging into Facebook will happen on the PHP side. I’ll see if I can help. Thank you for this excellent tutorial. I followed the instructions as you explain it to read a database and show only one row of them in AppInventor. When I show the php file in my browser, I can see one row only. You’re very welcome 🙂 Are you certain that you set up the database in the same way? Make sure your rows are all the same. Sorry, but I’m not sure what could have gone wrong. Hi Mr.Bana, I have been following your instructions for this tutorial, however I am having issues.. The ‘GetCust’ and ‘UpdateCust’ button don’t do anything.. And the ‘Listpicker’ return just a black screen to me. The problem probably lies with the database. It has to be exactly the same as mine. Please double check that and the problem should be fixed. Sorry, but I’m not sure what you need. I have all of the files used under the video. There is probably something wrong with the database setup. Make sure everything is exactly the same as I present here. Thank you 🙂 You can change the query in any way, but you’ll then have to figure out how to find the data in the list through trial and error. Hello Derek Your video is amazing. I’m about the app works 100%, but when datas are saved, app sends me the following error: can not parse text argument to “list from csv table” as a csv-formatted table. I think this error comes from the module “When web1. GotText” but I do not know why. Database is recording all right but ListPicker doesn’t run because the error. I’ve already fixed the problem. I have added a “Web2” for the “Update” and for a new Button as “Delete”. When Web2.GotText runs, data are cleared on screen. With your programming when runs Web1.Got Text after “Update”, there was a problem with the creation of an unnecessary “csv table text”. Now all is ok. Besides I have added a “Exit” button. your Web1 for the “Get Customers”, and the my Web2 for the “Submit”, “Update” and “Delete” buttons. Are you using the same setup as I used here? is this safe from sql injection? There is something wrong with the url. Try testing in your browser. Send me the whole link and I’ll take a look. i have same problem when i click send Error 1109:The specified URL is not valid:%20h%20t%20t%20……..} do you have solution? Yes your code is putting a %20 between every letter. %20 should only replace any spaces in your URL. You’re awesome. Yours is the only complete tutorial I waas able to find. Thank you millions..
Can you use localhost instead of online hosting? Please can you tell how to use blocks to retrieve data from sql database server on another screen!!! Hey Derek/ Your video was really inspirational and insightful. Thank you so much. Will you be making one on how to connect your app inventor project on a local host any time soon? Thank you 🙂 I’ll try to make an example for that in my new Android tutorial soon.